Roast rabbit, deadly wine and an unfortunate amount of the Citadel’s famous stew. Arya serves poison wine to every male member of House Frey. 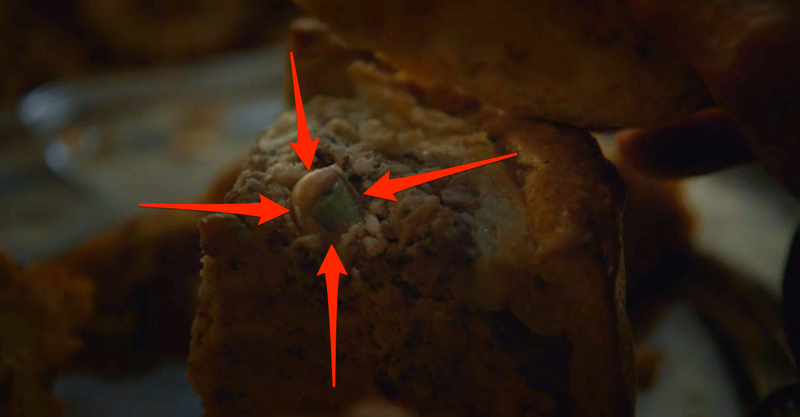 After giving us one of the most horrifying Game of Thrones food moments of all time last season with the human pie she served Walder Frey, Arya followed her masterpiece up by wiping out the entire male side of House Frey with glasses of the finest (and most poisoned) Arbor Red wine. While in disguise as the recently murdered Frey patriarch, Arya held a follow-up feast to celebrate the accomplishments of all of the men in the Frey family. At the toast, each of the men took a long sip of the fancy wine Arya-as-Walder served as a special treat and, soon enough, the only living people left in the room were the severely mistreated female members of House Frey. The Hound enjoys some mystery meat by the fireside. While Sandor Clegane, aka The Hound, has basically returned so that we can finally see the #cleganebowl we’ve all been waiting for, he is currently undergoing some spiritual enlightenment. While traveling with the Brotherhood Without Banners, Clegane and company stop in an abandoned house for the night, which turns out to be the home of a family Clegane left to die a few seasons prior. While he does nobly bury the bodies later on in the episode, he first enjoys some mystery meat straight from his pocket while warming up by the fire. Speaking of fire, soon after eating his meat snack, Clegane sees a vision in the flames of the White Walkers making moves north of the wall. All of this makes us think: Seriously, how long was that meat in his pocket and can we get some? Arya enjoys some of Ed Sheeran’s roast rabbit. After seemingly snuffing out the entire Frey lineage, Arya begins heading south towards King’s Landing. Along the way, however, she encounters a band of Lannister soldiers who have stopped for the night to camp. 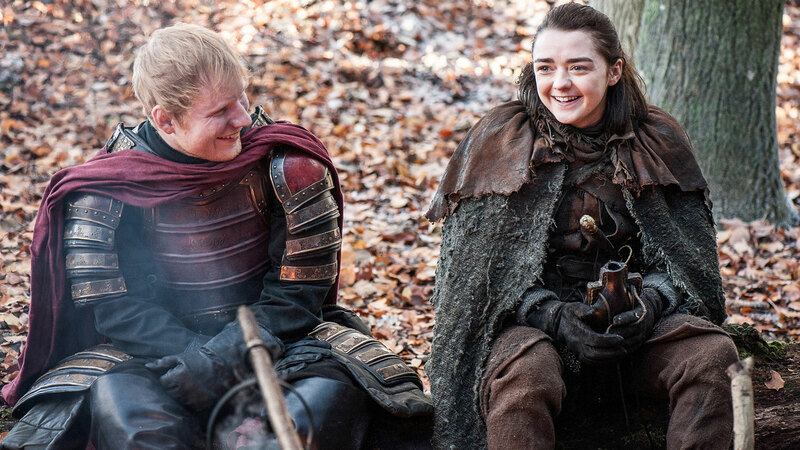 After being drawn in by the soulful sounds of the only redheaded Lannister soldier in history (Ed Sheeran), Arya enjoys a bit of roast rabbit and blackberry wine before bluntly telling the soldiers that she’s heading to King’s Landing to murder the queen. While the soldiers laugh it off almost instantly, there isn’t a hint of humor in Arya’s tone. Cersei would rather drink (understandably) then talk to Jaime about the past. Things between the sibling-lovers are a bit Casterly rocky at the moment. When Jaime returned to King’s Landing at the end of Season Six after helping defeat the Blackfish at Riverrun, Cersei had subsequently killed every one of their local adversaries, drove their last surviving child to commit suicide and then claimed the crown for herself. Jaime attempted to bring these things up with his queen-sister while they gazed at a massive map of Westeros that she had painted in the courtyard of their castle, but rather than speak of it, Cersei reached for her very full bottle of wine, which he have to assume was either A) a refill or B) she'd just woken up. Sam and the terrible, horrible, no good, very bad life at the Citadel. Sam is studying to become a maester at The Citadel and since he is at the bottom of the totem pole, he is stuck handling the tasks that no one else wants to do. Unfortunately these include serving an unsightly grool-meets-stew to the senior maesters and cleaning their chamber pots. To make matters worse, the episode includes an extended montage of Sam performing these all-too-similar tasks back to back. Hurry Sam, you have a world to save and frankly, we can't handle too many more of your "day in the life" snippets anyway.